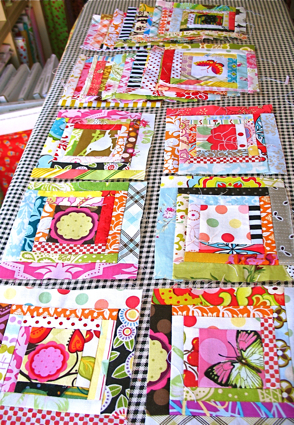 More scrappy therapy - Stop staring and start sewing! 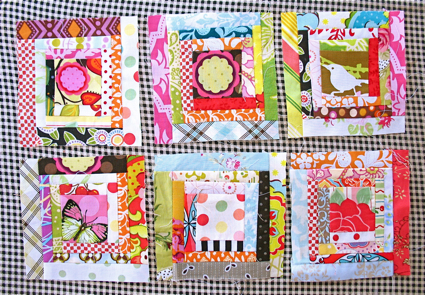 I had time to sit down and put together 6 more scrappy cabin blocks. I'm really happy with them. I really like the fact that I can use my little scraps since all it takes a 1 x 2.5 inch piece of fabric to get started (that little piece is the first piece you sew onto the center square). So don't throw anything away!! So far I'm up to 19 blocks (!). I bought enough batting to make a decent sized lap quilt so I may use my blocks for that (big enough to be useful but small enough to keep me from being intimidated). 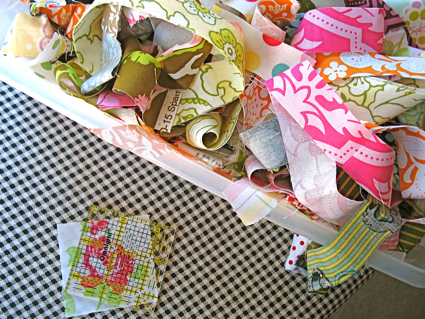 I'm trying to keep a decent supply of 1" strips in a box so I can sit down whenever I want to sew something (anything!) but don't want to work on a big project. I bought a 2.5 x 2.5 inch plastic square to cut my center square with. It was kind of spendy (over 4 bucks for a piece of plastic!) so the verdict is still out as to whether it was worth it or not (I'll let you know when I reach a decision). Joey and I are going to a friend's birthday party tonight (no kids allowed!). We'll be bowling so I'm hoping I don't embarrass myself since I spent a great deal of my childhood in the bowling alley (the nursery anyway) and I'm hoping some of my mother's skillz rubbed off on me (she's had the same bowling shoes for 40 years!). I'm assuming it will smell like cigarette smoke and chiklets when I walk in the door (ah, sweet memories of the 70's). The birthday girl is a great cook so I think she'll like the apron I'm giving her (she doesn't have to know it's one of my rejected proto-types!). Fun!! Have a wonderful weekend!